Camping in Canada for many Canadians is the key ingredient to a successful summer. Camping means something quite different to each individual depending on the tolerance level and ability to accept outdoor conditions of the individual. Financial capacity and willingness to bring the comforts of home to your outdoor adventure can also change a camping style. This means that there is a vast array of camping experiences available to you in Canada and if you are going "camping" with someone for the first time, you may want to ask questions and discover what "camping" means to the individual or group you are going to be sharing the outdoors experience with. I say this with a smile but it is also a grave safety concern. 1) Will you be hiking to a campsite with no facilities and carrying all of your own supplies with you? This to some is just pure torture. To me, it is heaven! 2) Will you be hiking in a well established park or on crown land? What is the difference? In National and Provincial Parks there are nice trails and lots of safety features. On crown land, you are like Robinson Crusoe and you better be prepared to survive. 3) Will you be driving to a campsite and setting up camp? If you do not require a backpack it will certainly change what you will be packing for camp. 4) Does the campsite have washrooms or showers? For my wife, this is the important question. Provincial Parks have great facilities but many of them do not have showers or flush toilets. Are you prepared to deal with the hardship of smelly outhouses? To be honest, that is one reason I like roughing it on crown land. On Crown Land there are no buildings and I make my own washroom by digging a small hole and filling it back in when done. This way there is no smelly outhouses and no impact on the environment as long as you are a safe distance away from any body of water. 5) Will you be in a tent, back country cabin, yurt, or motorhome? All of these options are called camping as well. The difference is the size of your budget. 6)If you are camping for the first time with a group, the most important factor for you may be to find out what activities will you be doing on the camping trip. This information will allow you to pack the correct gear. Many folks like to just completely relax in a lawn chair and sit by the fire all day and night...usually this activity is combined with copious amounts of drinking alcohol. Other folks will have boats and fishing gear so you will have to ensure you have the proper life jackets for you size etc. If you are camping with me, expect a good hike, possibly a little shelter building and being awed by various wild animals in their natural habitat. That is camping to me but I also enjoy just doing almost nothing while tenting or living in a motorhome near by a lake close to home for the weekend. Whatever type of camping experience you decide on embarking on, have fun be safe and when you get back home, drop by TracksAndTrails to rate your camping experience. The following posts listed below are a few examples of different types of camping opportunities in Canada. Price Compare Outdoor Equipment and Clothing with our tool on the right side bar. Scroll down and enter the Outdoor gear item in the box. It is located to the right, you may need to scroll down. Compare prices for any outdoor item or clothing article in dozens of outdoor stores. This tool will search over 100 000 Outdoor Equipment items. Clothing, Footwear,tents, backpacks, knives, hatchets, food, and much more! Just type in a general term or exact product name to search and start saving now! Leave No Trace, The Ethics of Outdoors, there is no 7-11 out there in the wilderness, from down the underground rivers, to the woods of the forests and up to the peaks of the mountains. Planning ahead of the activity goes into action. For outdoor recreations such as trekking, hiking, or canoeing, everyone needs energy. Some people get so excited that they underestimate the energy they would need out there, so they go unprepared, not thinking the best food they should bring with them. Being prepared is the best. I have here a list of what I believe they should think of when packing for outdoor trip foods. Most important is energy. Every bones and every muscles you have in your body will be used while you are outdoors. Every move, every effort you give will drain energy from your body essentially making you tired along the way. Think of food that can give you energy. Weight. Since you will be going out your house, you will be carrying the food and other stuff you would need, like tent and extra clothing. Think of food that is not heavy and will not give you much weight. Trash generated. Think of the garbage the food will produce when you bring them; these includes containers and left overs. Remeber Leave No Trace. Time to prepare. If you make it to preparing foods, I believe you have prepared an itinerary for the activity. You don’t want to be late on your own plan right? Will the food last until the end of the activity? Since you are outdoor, you will be dealing with different climate conditions. Price. Self explanatory, unless you are Bill Gates. Alright, now taste. Who don’t want to eat tasty and delicious food??? I also came along this website, where you can calculate the energy you most probably need along the trail. Omni-Heat Thermal Reflective and Insulated Jacket from Columbia - the heat is on! Oh yeah, you heard it hear first folks. Columbia’s new Omni-Heat Thermal Reflective jacket looks to be a huge hit for we Canadians and anyone else in the world who likes to be outdoors in the cold. with revolutionary new thermal technology and without the added bulk! Columbia is sending me one of their jackets to try in the field and the opportunity to test their new Omni-Heat jacket or parka is exciting. I look forward to the test. I have always loved the Columbia product – from shoes to jackets. My wife finally made me throw out my old pair of Columbia’s hiking shoes (the shoe didn’t wear out after two years – just the sole) and I still have the shell left from my Columbia jacket. Now the fact that it is still together is amazing. I’ve built quinzees, backcountry shelters and lean to’s as well as used the same Columbia jacket for work on a daily basis after I figured I put too much campfire smoke and hot flying sparks through it for casual winter wear around town. Anyway, when I get the new Columbia jacket, snow should be getting closer and my snowshoes are begging for more extreme snowshoeing so I should be able to give it a good test and report back here with all the performance details. Looks like it is going to be a nice winter! At Mosquito Lake you can enjoy 3 Campsites and will be able to get there with a two wheel drive. Site Description:This is a perfect lake for exploring in a small boat or canoe. The irregular edge has several quiet little bays accessible only by water. The lake is popular with families as it offers good fishing and swimming. The Mosquito Lake Recreation Site is well located for a base camp to explore the area and visit some of the other lakes nearby. Free Camping at Lang Lake Interpretive Trail (Parking Area) in Parking Area you will enjoy 0 Campsites and be able to get there with a two wheel drive! You will get from there, nice Canoeing service, attractive Fishing facilities,Hiking , Natural Study & Great Camping opportunities. Site Description:Approximately 2.5 km trail that is also known as the Wet Belt Interpretive Trail. Driving Directions:Acccess is off the Lang Lake Road. Type: No camping but a great boat launch. Kalum Lake a little hike that actually takes place within some 400m of the Nisgaa Highway, sterlingmountain from the north shore. You will able to see a bunch of warblers and pair of mountain bluebirds. Lots of fry in the slower sidechannels and river edge would definitely get your fixed on. The north end of Kalum Lake offer you paved boat launch and parking as well. If you would be lucky enough, you might share the trail with Mr. Toad hiding behind some blade of grass. A look west up the Kitsumkalum river above the lake is breathtaking. With a map, GPS you may be able to enjoy the Hiking Trail in from the road. The flood plain with cottonwoods along Wesach Creek and Mountains at Kalum Lake also welcomes you and don’t forget to check out the cedar river estuary ! Free Camping at Hudson Bay Brigade in Cascade you will enjoy 0 Campsites and be able to get there with a two wheel drive! You will get from there, nice Canoeing service, Hiking, Horseback Riding, Nature Study& Great Camping opportunities. A you may know, a FireSteel.com FireSteel is the surest way to start a fire in survival situations. 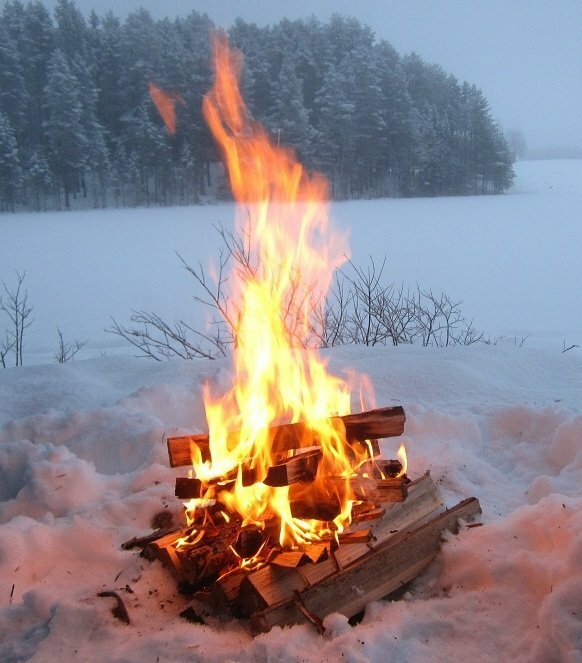 How To Stay Warm When Camping? Do not drink lots of fluids at night so that you need not go to the bathroom at midnight. It makes you loose heat faster by taking your clothes off! You may wear a stocking hat and covered your head. It may keep you warm if you use two closed cell foam pads beneath you. Warm up the sleeping bag with boiled water bottle. wear thin layers of clothing than a thick jumper. It will let warm air circulate. wear fingerless gloves in bed both hands and legs. Put your head inside the hood and snug it down so just your nose is exposed. You don’t want to breathe inside your bag. Wearing an entire fleece suit, socks, mittens and hat. Stay dry and is crucial to stay warm. Never let you get sweaty prevent sweating because when it stop will cool you too. Try to keep your sleeping bag dry as possible and get a sleeping bag at least 10 to 20 degrees decent quality sleeping bag whether double or single.. Roll rocks in towels etc. and place in foot of sleeping bags or wherever. Make your camp in such a way that you take advantage of the nature materials. Dinner with lots of calories will give your much heat. Plan for a midnight snack if you wake up cold you this snack warm you back again. Be aware of overheating at night. Being too warm produce sweat. Before going to bed make sure your feet dry enough. You can do it by a dry sleeping socks. Do not wear tight fitting cloths. Wear loose fitting clothing as possible will allow air circulation and make you warm. A roaring campfire will certainly provide some heat, but you’ll need to think about insulation if you want to keep your tent from losing its stored heat. You may pick up heat packs with you before your trip from store. There are dozens of options out there if you are in the market for snowshoes and if you are considering your first purchase it can be quite daunting, so here is some information to consider. First consideration should be what type of snowshoeing you are going to do and once you have that answer then you can look at the different types that are out there? Keep in mind you can not buy one snowshoe that will be perfect in every snowshoe outing. All styles of snowshoes allow you to travel across snow-covered ground without sinking or struggling. They provide flotation by spreading your weight evenly over a larger flat surface area. This flotation allows you to hike, climb or even run! Generally, the heavier the person or the lighter and drier the snow, the larger the surface area of the snowshoe needs to be. These snowshoes are smaller recreational snowshoes that are suitable for total weights not exceeding 50 kgs. Many styles are as durable as adult models, and can also be used by small adults. My choice if you are considering this smaller style for children is to buy second hand ones either from a second hand sports store or even from a rental shop at the end of the season as they often sell off used stock. These snowshoes are ideal for walking or hiking on terrain that is not very steep or rugged. Most are styles are now made from aluminum or hard moulded plastic. These snowshoes are more technical in design and usually made with highly durable materials that can withstand harsh conditions and terrain. They are aimed at the more aggressive snowshoer who wants to blaze trails for a day hiking, tackle winter summits, backpacking or backcountry snowboarding. Often outfitted with snowboard-type bindings or climbing crampons, these are intended for steep ascents and uneven or icy ground. Always most expensive. These snowshoes are made for cross-training and competitive snowshoeing on packed trails. They are lightweight, durable and more manageable, many times with a cut out inside tail section so you won’t step on your inside toe section. Upturned toe for easier management and minimizing snow build-up, a must have! Traction Devices- Although your weight provides some traction by pushing snowshoes into the snow, most modern aluminum styles feature crampons or cleats. These allow you to maintain a good grip on packed, icy or steep snow. Some bindings are lighter and fit snugly, such as those made for running, while others are designed to be worn with heavy boots and have ratcheting straps. These types usually consist of a platform with nylon straps that go over the foot and around the heel; 3 points that get tighten individually. Rotating Bindings pivot where they attach to the decking, under the balls of the feet. This allows you to walk easily and climb hills. All bindings should be adjustable, best to choose a and have some rotation to minimize tail drag on groomed snow, the two point side attachment really only works for low level flat packed terrain and should be avoided as its too limiting. As you can see snowshoes are no longer the huge clumsy wooden bear trapper styles you may remember from years ago. Modern snowshoes are sleek, light and very effective for walking through the snow. If you like getting outside during snowy winter weather, a pair of snowshoes can help open up many new winter-time activities from simple low level shoeing on a frozen lake to part of the Kettle Rail Way to Geo Caching, just keep in mind that most of those treasures will be well hidden under snow but that should not stop you from getting off the couch and getting out there and having some fun! 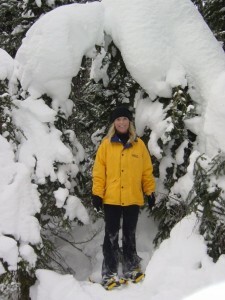 Visit Osprey Lake Retreat to enjoy a winter retreat and to try out your new snowshoes. Free Camping at Horseshoe Canyon in Okanagan you will enjoy 5 Campsites and be able to get there with a two wheel drive! You will get from there, nice Canoeing service, attractive Fishing facilities, enjoyable Boating facilities, Swimming & Great Camping opportunities.